First post so be gentle Just got myself a Bosch Sensixx B2 (TDA3605GB) for 17.99 at Sainsburys Cameron Toll (Edinburgh). Seems to be store specific (thanks, Squelds!) . Other irons also were up to 70% off, for example, Bosh Sensixx B1 was 14.99. This powerful 2400 watt iron from Bosch offers a combines a convenient self clean feature with a specially treated sole plate to create an easy care everyday essential. The 3 metre cord offers flexible movement. 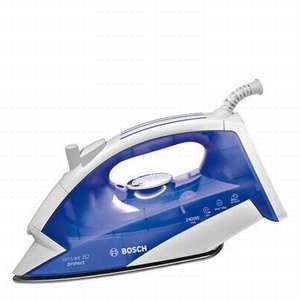 This dark blue TDA3605GB iron from Bosch features a drip-stop leaking protection system, a specially treated stainless steel soleplate, a 100g per minute steam shot design and a powerful 2400w function. i love my Bosch iron, it has a click on plastic soleplate that stops clothes going shiny, dont think they make that model now though. Deal posting newbie! This is Zenec first deal post. Help out by leaving a posting tip or just to show your appreciation for their contribution.